It's bubble wrap. It's free. Download it. Ah yes, the joys of bubble wrap. We can't begin to count the number of times we unwrapped something, tossed it aside and got busy popping. Now the fun comes to iPhone with BubbleWrap, the video game, and while there's not much to it, it's a decent substitute for the real thing. 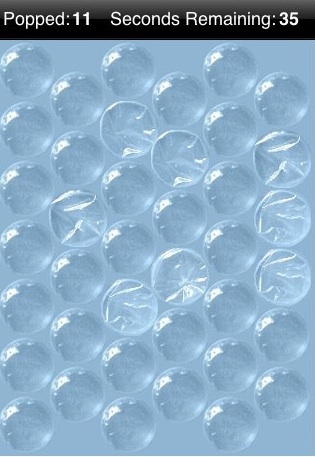 So here's what you get: one sheet of bubble wrap and 45 seconds to pop till you drop. That's it. No levels, no high score section, no music, no narrator; it's just you and those tiny bubbles. It seems like a bad deal, except that it's a free App. Not only that, but it plays well. You simply tap the bubbles and they make a popping noise, and after you pop them all, some re-inflate, forcing you to frantically pop before time runs out. That said, it would have been nice to record high scores. Sure, the App is free, but any game designer should know that his or her users would want this feature. However, for what it is, BubbleWrap is a decent game that's good for just a couple minutes a day, or at least until you receive a lucky present or package. What's Hot: Seconds of bubble popping goodness. What's Not: Doesn't record high scores, gets boring fast.